The phenomenon of bioluminescence is the production and emission of light by a living organism as the result of a chemical reaction. It should not be confused with fluorescence, in which light is absorbed and later re-emitted. Both forms of light production are examples of luminescence, or "cold light" emission, wherein less than 20% of the light is thermal radiation (in the infrared and microwave wavelengths). The phenomenon has evolved independently at least 30 times in the history of life. Most bioluminescent organisms are marine, with only a few terrestrial and freshwater species capable. Marine species tend to emit light of wavelength between 440 and 479 nm (bluish), which is the range of greatest optical transparency of seawater. Although some Cnidarians emit light of a greener color (505 nm), this is a fluorescent phenomenon in which blue wavelengths are fluoresced at a longer wavelength. Most terrestrial examples of bioluminescence emit more in the green wavelengths, as longer wavelengths can penetrate farther in air than in water. Camouflage - Some species produce blue or green light to simulate the incoming light from the surface, effectively making the organism invisible to those below. The cookiecutter shark does this, but leaves a small black patch as a lure for predatory fish that it can attack when attracted. Attraction - Most species use bioluminscence to attract prey or mates (anglerfish, fireflies, etc.). Some dinoflagellates use a slightly different approach, whereby they luminesce when a predator is near, to attract animals that feed on the plankton's enemies. Repulsion - Certain squid and crustaceans use bioluminescent ejecta to confuse or repel predators. Communication - Bacteria and other organisms use bioluminescence to keep in contact and maintain colony aggregation. Illumination - While most marine organisms emit blue and green light, the Black Dragonfish can create a red bioluminscent glow. While red light does not penetrate far in the water, any red-pigmented prey will be illuminated with the prey completely unaware of the light (since essentially no marine species can see red light). Interestingly, even the dragonfish itself cannot see red light, and instead relies on a relay of pigments to "reverse-fluoresce" the reflected red light into the blue and green it can see. For most single-celled organisms, a mechanical deformation of the cell's surface creates a potential over the vacuole membrane, allowing protons from the acidic interior of the vacuole to contact the light emission chemistry in the cell and bioluminesce. This explains why the wakes behind boats and crests of waves, with a good deal of mechanical agitation of the planktonic life, are often a shimmering white (in day) or blue (at night). The mechanism of bioluminescence is the result of chemical reactions involving a class of chemicals called luciferins ("light bringers"). The luciferin oxidizes in the presence of a catalytic enzyme (luciferase) to create light and an ineffective compound (oxyluciferin). Most often the process is not reversible, and new luciferin must be acquired through the diet or internally synthesized. An example of the regeneration pathway for firefly luciferin is given here. Sometimes the luciferin, oxygen, and catalyst are bound together as a photoprotein, which can be triggered to produce light by ions (like calcium) and hence can be controlled by neural pathways. These photoproteins (much like the pigmented cells called chromatophores that enable many organisms to camouflaged by changing skin color) can then be controlled in a way that allows the organism to use light flashes at will. 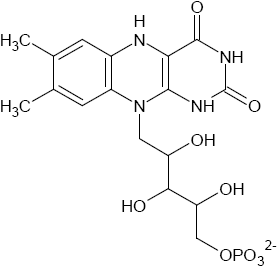 Bacterial Luciferin - This is a reduced riboflavin phosphate (FMNH2) found in bacteria and symbionts that house the bacteria. Dinoflagellate Luciferin - Derived from chlorophyll, this luciferin is found in dinoflagellates and the euphausiid shrimp (krill) that prey upon them. Fungal luciferins - The biochemistry of fungi bioluminescence is poorly understood at the moment. Some putative emitters are illudins, a family of sesquiterpenes that appear to have some antitumor properties; lampteroflavin, an FMN derivative; and panal, a sesquiterpene precursor. 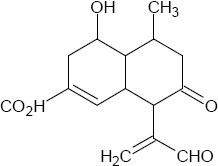 As panal is really just the luciferin precursor, the speculative structure for fungal luciferin is shown here. 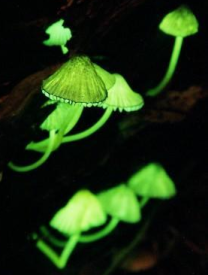 These luciferins may provide the greenish "foxfire" glow of many species of mushroom. Unfortunately, many of these same chemicals are incredibly toxic in their natural form. 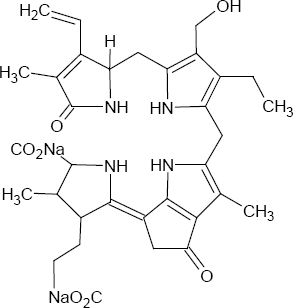 Vargulin - This luciferin is found in ostracods (seed shrimp) and many of the fish that eat them. 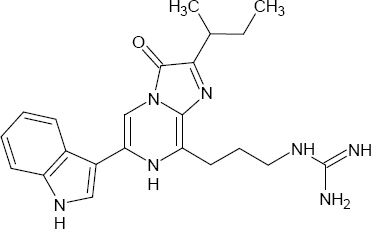 Coelenterazine - This widely used luciferin is found in radiolarians, ctenophores, cnidarians, squid, copepods, decapod shrimp, mysid shrimp, fish, and chaetognaths. 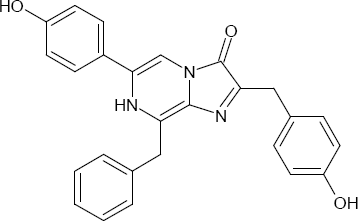 Firefly Luciferin - Found in fireflies and glowworms, this compound requires ATP as a cofactor, and hence can be used as an indicator of cellular activity. Family Vibrionaceae (phylum Proteobacteria) contains most bioluminescent bacteria, typically found as symbionts with deep sea animals. They are gram-negative, and possess one or more flagella. The type species of this family, Vibrio cholerae, is the agent for the cholera disease. All bioluminescent bacteria use bacterial luciferin. These bacteria can create the phenomenon of a "milky sea" known to sailors for centuries. Trillions of bacteria can aggregate into a huge colony (visible from space) that luminesces as a bluish-white patch on the ocean. These are single-celled algae that use a luciferin derived from chlorophyll. At times in the spring and summer, or when human activity increases phosphate concentration near the coast, large blooms can cause "red tides" with fabulous bioluminescent displays. Many species, though, secrete neurotoxins, and these algal blooms can devastate coastal ecosystems. Most species follow a circadian rhythm in their luminescence, producing the most light at night. These amoeboid protozoa use coelenterazine to bioluminesce, and their skeletal remains cover much of the ocean bottom in a "radiolarian ooze". Over time, this can petrify into the sedimentary rock chert. The green glow emitted by wood-decaying mushrooms and other fungi is sometimes referred to as "foxfire". This light is bright enough to see by, and was suggested by Benjamin Franklin as a light source for the early wooden submarine, the Turtle. It was also used by Tom Sawyer to light his underground passages in Mark Twain's seminal novels. Over 40 species exhibit the glow, including members of the genus Omphalotus (Jack O' Lantern mushroom, ghost fungus), the honey mushroom, and many others. Nearly all use the luciferin illudin, and hence are toxic to ingest. 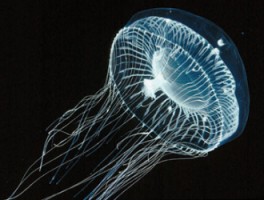 Scyphozoa (jellyfish), Hydrozoa (hydras), and Anthozoa (sea pens and sea pansies), as well as the closely related non-cnidarian Ctenophores (comb jellies) all use coelenterazine as a luciferin to attract prey. Ctenophores can also produce other colorful displays with diffracted light through their comb plates. There are several types of worms that exhibit bioluminescence, both marine and terrestrial. The marine worms are one species of Nemertea, one species of Chaetognatha (arrow worm), and several polychaete and hemichordate worms. The only terrestrial worms that display any bioluminescence are the annelid oligochaetes (earthworms). Earthworm luminescence is produced by the coelomic fluid, and ranges from blue to orange depending on the species (check here for the Diplocardia luciferin). A few nudibrachs and clams are known to bioluminesce, along with many species of squid and a few octopods. One type of limpet and one species of land snail can also produce light. In addition to producing light, many cephalopods also have the ability to control color and pattern expression through chromatophores: special pigment-containing cells whose relative size can be altered at will by the animal. Many types of crustaceans bioluminesce, including copepods, ostracods, amphipods, mysid shrimp, euphausiid shrimp (krill), and decapod shrimp. Perhaps the most well-known terrestrial bioluminescent organisms are the fireflies, beetles of the family Lampyridae. Some phengodids (railroad worms) and elaterids (click beetles) also luminesce in yellowish green colors. Some flies of the family Mycetophilidae (fungus gnats) can create luminescent web-like structures to trap prey, and there are a few species of Collembola (springtails) that can be seen glowing in forest soils at night. These few families, however, make up the only luminescent insects on the planet. In addition to the insects, both centipedes and millipedes have been found to bioluminesce. For the millipede Luminodesmus luciferin, click here. Some starfish, brittle stars, and sea cucumbers can produce faint light, as well as a few of the closely related tunicates. Only a few sharks, like the cookiecutter shark, are able to make light. The cookiecutter shark in particular can produce a bluish light that makes it nearly invisible from below against the light blue surface. One small dark patch is maintained, however, to lure potential prey hoping for a small meal. On the other hand, there are numerous fishes that bioluminesce, particularly in the ocean deep, such as anglerfish, hatchetfish, gulper eels, and the unusual loosejaws (Malacosteidae), which actually produce a red light. 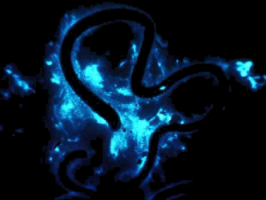 No known species of multicellular plant, amphibian, reptile, bird, or mammal is known to produce bioluminescence, but due to recent advances in recombinant gene technology, various fluorescent proteins have been spliced into other organisms and given them the ability to glow. There are many potential applications for this technology (besides having novelty pets!). Trees that emit light could save energy costs for highway lighting at night, as well as reducing electrical fires from electric lights on Christmas trees. Plants that glow when they need water could help save irrigation costs, and microorganisms that luminesce can be used as assays or indicators in a variety of situations. Thanks to Haddock, S.H.D. ; McDougall, C.M. ; Case, J.F. from "The Bioluminescence Web Page" and "KrillOil.com" for most of this information.